Tools apps for Android devices include a variety of useful features. With these apps, you can monitor your phone’s data usage, manage files and apps, use your device as a broadband modem, back up your device’s data, scan new apps for malware, and quickly uninstall apps. 3G Watchdog (free): This app helps you keep an eye on your mobile data consumption. 3G Watchdog sits in the background, monitoring your received and transmitted data usage. It places a green icon in your device’s notification bar, telling you that you aren’t near your data cap. The icon turns orange when you approach the cap, and red when you go over. Astro File Manager ($3.99 US): Astro File Manager helps you manage all the files, apps, and directories that reside on your device. Unless your device’s manufacturer installed a file manager, without one on your device, you’re relegated to managing your device’s files from a computer that the device is attached to via a USB connection. Although this is sufficient some of the time, there are often times you want to manage files directly on the device. EasyTether ($9.95 US): EasyTether lets you tether your laptop computer to your smartphone, enabling you to use your smartphone as a broadband Internet modem. Depending on the phone and service, a laptop can attach to a smartphone via a USB cable or Wi-Fi connection and piggyback on the phone’s Internet connection. Sending and receiving a lot of data from a tethered laptop might exceed your mobile data package’s monthly data allowance. After you hit your cap, you accumulate additional charges. 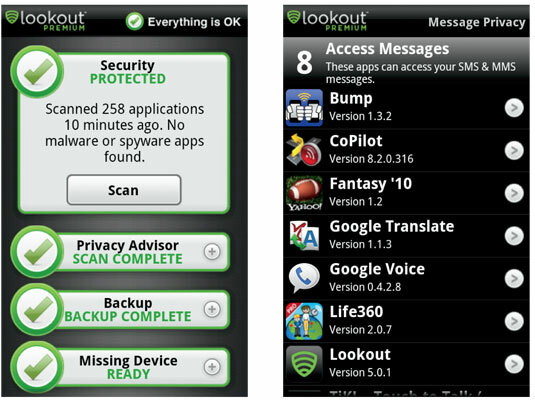 Lookout Mobile Security (free): Lookout Mobile Security automatically scans every new app you install to ensure that it doesn’t contain any malware that can infect your device. This app can be configured to scan all of your installed apps on a daily or weekly basis. You can also manually launch a scan of your apps at any time; the figure on the left shows the results of such a scan. If you ever lose your device, you can use the Lookout Web site to help locate it on a map. You can also use the site to make your device emit a loud “scream” for 60 seconds, so you can find it if you just misplaced it somewhere nearby. 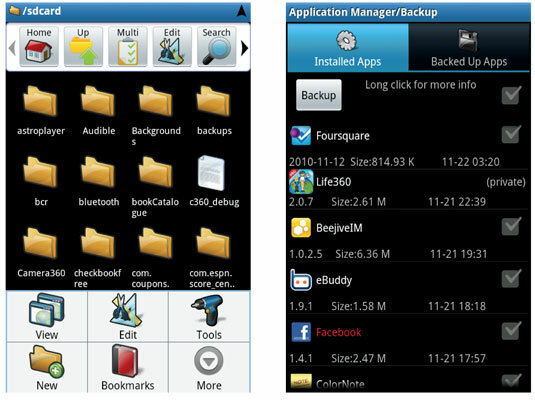 MyBackup Pro ($4.99 US): MyBackup Pro can back up a device’s applications, contacts, call log, bookmarks, SMS and MMS messages, system settings, Android Home, alarms, dictionary, and calendar. You can back up to your device’s SD Card or to the MyBackup online service. You can restore backed-up data to the same device or a new device. SwiftKey Keyboard ($3.99 US): SwiftKey Keyboard is an “intelligent” keyboard that predicts what words you’re typing based on just the first few letters and also has an uncanny capability to know when you misspell a word. The more you use it, the better it gets at predicting words — it learns from what you write over time. SwiftKey Keyboard even builds a voice-to-text module into the keyboard so that you can speak the text you want to input. SystemPanel App /Task Manager ($2.99 US): SystemPanel App / Task Manager provides a wealth of information about your Android device, how the device’s resources (such as CPU, memory, and storage) are used, and shows details about running and installed apps. Tasker (£3.99): Tasker is a powerful tool that lets you program your device to perform particular actions or behave in certain ways, depending on any number of variables, such as the time of day, the device’s specific location, or when a particular app is running. Uninstaller Pro (free; ad supported): Uninstaller Pro is a simple app that quickly uninstalls apps from Android devices. And it performs this task admirably with features such as searching for apps by name, and the capability to sort the list of installed apps by name, size, or date installed (all in ascending or descending order). With this app, you can select multiple apps and perform batch uninstalls. Vlingo: Words to Action (free): Vlingo: Words to Action does exactly what its name implies. Speak a command and the app does what you tell it to. This voice command app accesses functions on your device that are typically relegated to keyboard input. Instead, just tap the Tap & Speak button, speak a command, and then tap the Done button. Vlingo: Words to Action then performs the task or fetches the requested information.